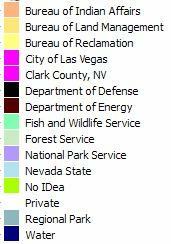 A Garmin Custom Map of the Land Status/Ownership in Nevada. Both files can be used separately. If used in conjunction the "better" one doesn't show until zoomed in. Please remember that this is not a vector map, so there may be (additional) errors due to compression artifacts. Always verify the correct status at the appropiate Field Office or Agency. Tested in an Oregon 450 and Google Earth.